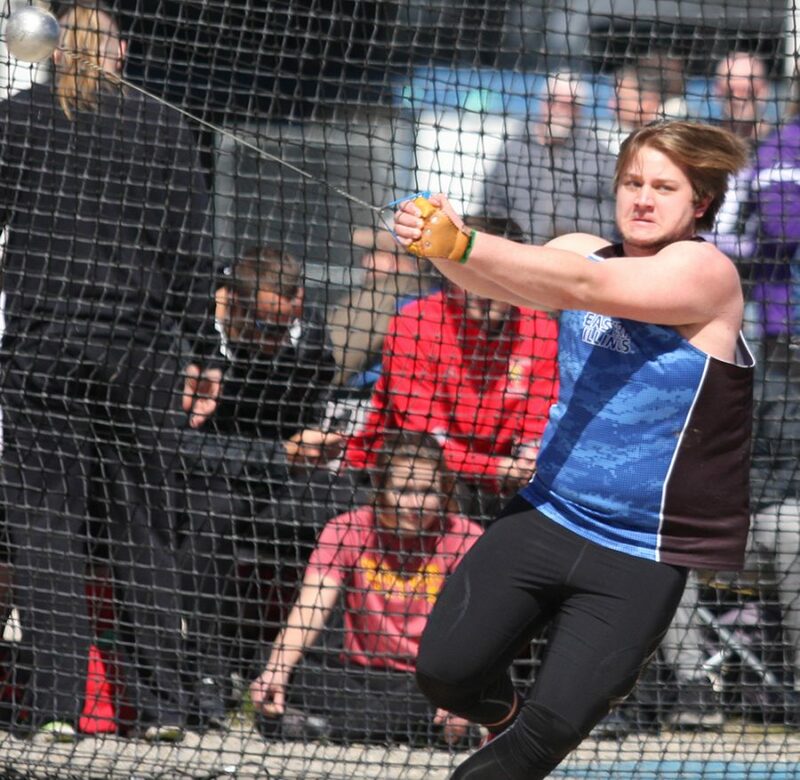 Dillon Birch competes in the weight throw during the Eastern Illinois Big Blue Classic in March. Eastern finished the meet second out of six teams. The Eastern track and field program showed up to compete at its first home meet of 2019, finishing with 17 top-two finishes, including seven first-place finishes at the John Craft Invite. “I was pleased with this weekend’s performances. As a coach we always want more obviously, but I think we are definitely headed in the right direction,” Coach Emmanuel said. “I think as we continue to compete over the next couple weeks we will only get better in our events, and I’m excited to see how well we develop. Sophomore Makenna Wilson finished second in the weight throw with a throw of 55-10.50. That throw would earn her the eight spot on the Eastern track and field record list. Sophomore Tadiwa Mhonde had a strong showing as he picked up one first-place finish and two second-place finishes. Mhonde helped the his 4x400m-relay squad of redshirt senior Brandan Lane, junior Anthony Bello and freshman Morris Seaton cross the line first at 3 minutes and 37 seconds. Mhonde also earned second-place honors in the 60-meter dash (6.93 seconds) and 200-meter dash (22.22 seconds). Senior Pedra Hicks earned the women a first-place finish in the 60-meter hurdles crossing the line at 9.15 seconds. The quartet of senior Abby Fisher, freshman Amani Jackson-Gladney, sophomore Chloe Irish and sophomore Avani Flanagan earned first-place honors in the distance medley relay with their time of 13 minutes and 17 seconds. Senior Ashton Wilson has continued to push past injuries and adversity to keep bringing positive results this weekend. Wilson earned second-place honors in the high jump with his height of 6-06.00. The track and field program will travel to Iowa City to compete in the Iowa Black and Gold Premier Friday and Saturday. “We did great as a team, and from this point forward all we can do is continue to practice and better ourselves as individuals so we can fight as a team when it comes down to it,” Wilson said.